He was the NHL's First Star for the month of November and its Third Star for December. "It's not if he's going to score, it's when and how," Blackhawks captain Jonathan Toews said. Kane's production has had a profound effect on the rest of the Chicago lineup, taking pressure off other big-time players, notably fellow top-six right wing Marian Hossa. 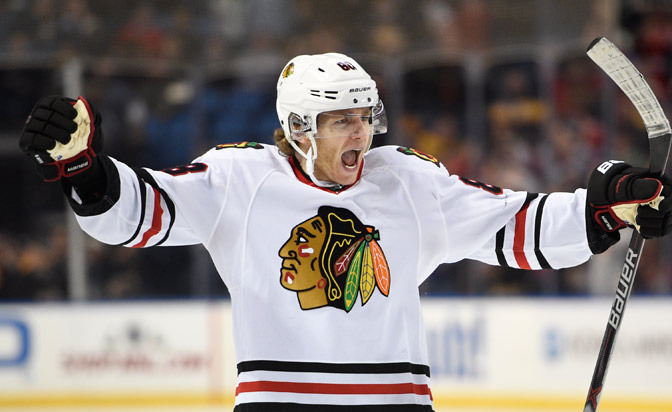 Hossa has seven goals and 21 points in 41 games. His average of 0.51 points per game is well below his NHL career mark of 0.89. He is on pace for 39 points, which would be a career low in a season in which he played more than 60 games. It hasn't mattered because of Kane, who has been dominant in almost every game this season and playing with a shoot-first mentality. He is on pace for 292 shots on goal; his career high is 261. With the jump in total shots has come an improved shooting percentage. Kane is shooting at a 15.2 percent rate; he was 11.9 percent for his NHL career entering this season. "We're seeing that consistent production pretty much every single night, which is a big part of staying on top of the scoring lead the way [Kane] has," Toews said. "It's not an easy thing to do, but he's playing well and he's playing with tons of confidence every night." Kane had at least one point in 39 of 46 games, including a stretch of 26 in a row from Oct. 17 to Dec. 13, when he set the record for most consecutive games with a point by an American-born player. He had at least two points in 17 games, with three or more in six games. He has played on a line with center Artem Anisimov and rookie left wing Artemi Panarin all season. Panarin was named NHL.com's leader for the Calder Trophy earlier this week. "It's a rare occasion when that line is not producing," Toews said. Most importantly, Kane's production has led to wins. The Blackhawks are 27-8-4 when Kane scores a point, 13-1-3 when he scores at least two, and 15-5-3 when he scores a goal. They are 2-5-0 with seven goals in the seven games he hasn't had a point. Chicago is on a nine-game winning streak, in part because of Kane's 13 points in those games, and its 62 points are even with the Dallas Stars atop the Central Division. Braden Holtby, Washington Capitals: Holtby has been the most dominant goalie in the League and hasn't lost in regulation in 23 consecutive starts. He is 20-0-2 with one no-decision, two shutouts, a 1.85 goals-against average and a .939 save percentage during the 22-game point streak. He is the second goalie in the past 20 seasons to earn at least one point for his team in 22 or more consecutive decisions, joining Jose Theodore (2009-10, Capitals, 20-0-3). Holtby's 28 wins lead the League. He is also first in save percentage (.933) and goals-against average (1.90) among goalies with 20 or more appearances. The Capitals lead the NHL with 69 points in 43 games. Erik Karlsson, Ottawa Senators: Ottawa is on the bubble of the Stanley Cup Playoff race in the Eastern Conference. Imagine where the Senators would be without Karlsson, who is playing a League-high 28:39 per game and is fourth in the League in scoring. His 45 points lead the Senators and NHL defensemen, and his 36 asssists are second in the NHL behind Kane. He has nine more points and plays almost eight minutes more per game than anybody else on the Senators.